The public sector seems to be slipping in the efficient use of financial resources, with returns on deployed capital declining in recent years. Oil marketing companies like IOC, BPCL and HPCL, which are facing huge under-recoveries on the retail sale of petroleum products, seem to have dragged down the collective performance of the sector. 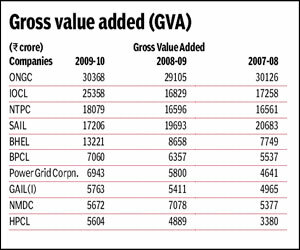 The gross value added (GVA) by 54 public sector undertakings in 2009-10 formed 24.81% of the capital employed as against 24.98% and 27.66% in 2008-09 and 2007-08, respectively. Similarly, the ratio of net value added (NVA) as a percentage of capital employed decreased from 24.80% in 07-08 to 22.37% in 08-09 and further to 21.95% in 09-10. The capital employed to value added ratio showed a decrease in 09-10 mainly due to low value addition in the public sector companies, according to an FE study. The capital employed increased from R5.73 lakh crore during 07-08 to R6.65 lakh crore during 08-09 and to R7.42 lakh crore during 09-10. The capital employed to value added ratio showed a decrease in 09-10 mainly due to low value addition. The GVA of PSUs increased by 4.75% to R1.66 lakh crore in 08-09 from the level of R1.58 lakh crore in 07-08 and further increased by 10.87% to R1.84 lakh crore in 09-10. The net value added also increased by 4.61% to R1.48 lakh crore in 08-09 from R1.42 lakh crore in 07-08 and further by 9.56% to R1.63 lakh crore in 09-10. GVA is a productivity metric that measures the difference between output and intermediate consumption. It provides a rupee value for the amount of goods and services that have been produced, less the cost of all inputs and raw materials. Of the 54 PSUs, the top ten in terms of gross value addition in 09-10 were ONGC, IOCL, NTPC, SAIL, BHEL, BPCL, Power Grid Corpn., GAIL(I), NMDC and HPCL whose share in the total during 09-10 works out to 73.45%. In the GVA by the 54 PSUs, salaries etc. are the largest factor followed by retained profit, tax, dividends,depreciation and interest.